sweets | Don't Worry, Drink Chai! Are You A Candy Gobbler? Let’s take a sip of our tea and ponder upon this a little shall we? Hmm… what is a candy gobbler exactly? How would one define it? If you’re the kind that likes to store or hide assorted variety of candies in the secret drawer of your desk, or you like keeping a few in your purse, or in your pockets, a little some in your car perhaps. Basically you consider them lunch, dinner, energy boosters, or emergency food. You still go trick or treating even though you are well beyond eighteen, more like twenty. Or you keep telling everyone, oh they’re not for me, they’re for the kids. And finally, if you’re trying to hide that giant candy jar in the pantry as we speak then perhaps the answer is yes! You are a candy gobbler! Please admit it, you will feel special. Ahh don’t you just hate it when you discover evil findings on things you just love! 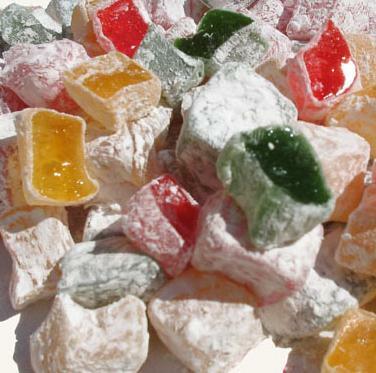 For example, I was just about to gobble a Turkish delight (if you don’t know what these are then just imagine a chewy Gumby bear in a small cube shape covered in massive white powder sugar. YUM, YUM!) when I saw the following news bit! Now just for fun let’s take a poll! My tea for the moment: A cup of STASH’s Moroccan Mint Green Tea. It really is refreshing and has a minty sweet taste to it.